Anna Casino is a relatively new Everymatrix casino, launched in 2014. The casino integrates 3 software providers and offers close to 200 casino games. We expect that with its bright and gentle design and great slots bonuses, Anna casino will appeal to wide range of slots fans and specially to the ladies in the house. Restricted Countries: USA, UK, France, Italy, Spain. USA Players please click here. UK players please click here. As you could guess, Anna Casino has a bright and feminine design. Of course that doesn’t mean that guys can’t enjoy it. Here you can find an interesting interview with Anna Casino CEO, talking about the concept behind the brand. The casino site is very simple – just few welcome offer, sign up form and 100 of games. One thing that I didn’t like is that some info is not available on the home page , like the banking methods for example. But, the moment you sign in, everything becomes accessible and clear. You do not need to download anything to start playing. All the games are available using the instant play mode. The casino offers 200+ casino games. In that slots section you can find 20 classic 3 reel slot machines, such as Safari Madness and Pirates Gold. Over 100 video slots and 16 progressive jackpots, including Arabian nights and Mega Fortune slots. Other games include 10 variation of Video Poker, all types of roulette, Blackjack, Baccarat, Holdem and Scratch Cards. To make it easier, you can create a list of your favourite games. To assist you, we’ve decided to list the slots that offer the highest winning odds. * The bonus can be wagered on slots only. Please notice that there are 3 restricted slots: Scrooge, Devil’s Delight and The Wish Master. On your first deposit you can enjoy a 100% match bonus up to €/$/£ 200. On top of that, with your first deposit you will get 80 free spins . (Currently it’s on Starburst slot machine, but it can change from time to time).The bonus must be wagered 40 times (x20 Bonus + deposit). Anna operates in all major currencies: USD, Euro, GBP, AUD, CAD and all European and Eastern European currencies. There is wide range of deposit and withdraw methods suited for each country. The minimum deposit is €/$/£ 10, while the maximum deposit amount is €/$/£ 5000. It varies a bit according to the currency of your choice. Banking Methods: Ecocard, Entropay, Instadebit, Euteller, Mastercard, Diners, Neteller, Paysafecard, Skrill, Trustly, Ukash, Visa, Maestro, Visa Debit, Visa Electron, Webmoney and Bank Transfer. Maestro is used only for deposits. 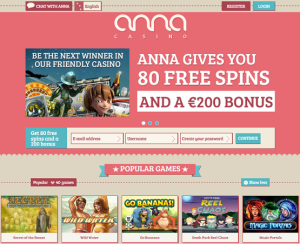 Anna casino charges 2.5% for deposits below € 100. Above that all deposits are free of charge. What is great about Anna withdrawals is that you can use pretty much all the deposit methods to withdraw funds back to your account. E-wallets are the best option since the payouts are done instantly. Prepaid cards take a bit longer, while credit cards and bank transfers are the slowest, 3-4 days. The minimum withdrawal amount is €/$/£ 15 and the maximum is €10,000 (or currency equivalent) per day. That should satisfy both, low stakes players and heavy high rollers. The first withdrawal of each month is free of charge while the following ones will have a € 2.5 fee. Your personal info, banking details and transaction are encrypted. The withdrawal process is fast and smooth. The casino is very straightforward in terms of gambling limits. You can limit your login periods, deposit amounts and even completely terminate your account. There are some casinos that allow all that, but rarely it’s done in such a clear and candid way. With multiple positive parameters like fast payouts, clean history in terms of fairness, Anna get’s 9/10 on our trust meter. The only reason that keeps them from perfect score are bonus wagering requirements that are not perfectly clear in terms of game contribution. Anna Casino support can be reached through Live Chat or email. Unfortunately, live chat support is available only on Monday to Friday, 10:00 – 18:00 CET. Rest of the time you will need to contact them by email. As could you expect from a newly launched casino, Anna is perfect for mobile play. You can play on every possible device. It’s very appealing and easy to use even on smaller screens. There are close to 100 mobile slots to choose from, including the special NetEnt touch slots. Anna is a light and friendly new online casino. It might appeal more to the ladies, but guys can enjoy it as well. Great variety of games, solid deposit bonus and a special €/$/£ 5 free chip with $500 limit cap that will get you started.